Success Story by Lauri T.
Okay, so here is a very telling ‘Before and After’ photo sequence. This is sooooo embarrassing!!! The picture on the beach was taken in Kaui in May 2010 to celebrate my 20th Wedding Anniversary. When I got home and looked at the photo’s, all I could think was that I looked like a beached Whale!!! 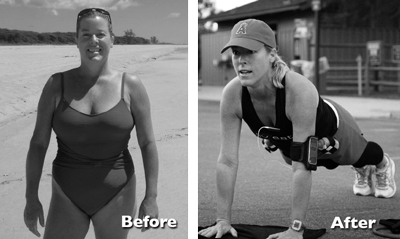 The picture on the right was taken 3 months later and 23 pounds less, at the conclusion of my second Studio Sweat Fit Light Camp September 2010. I was honored with the “Athlete of the Session” award demonstrating the level of dedication needed to get real results. I still have more fitness goals (at almost age 50 I am considering training for a Triathlon for the very first time in my life). I must say, it’s sure great to not feel like a stuffed penguin! Cat Kom, and the other wonderful trainers at Studio Sweat (you know who you are) get all the credit for helping keep me inspired to continue on my the journey to greater fitness. It never gets old or tiring.